In all of her years spent acting on stage and on the screen, Judi Dench has finally delivered her greatest performance yet: being remotely excited at the prospect of watching Big Momma’s House. Such is the simplicity and naivety that comes with playing a character like Philomena Lee, a woman who we see having gone through some tough times in her youth and yet remains optimistic in her darkest moments. The topic of Stephen Frears’ finest film since The Queen, Lee is represented as an opportunist who keeps to what she is used to despite the emotional abuse it causes her to go through. It should be no surprise that Dench is simply breath-taking in the role, delivering a perfect Irish accent that never becomes caricature and balances genuine moments of heartbreak while still making audiences laugh with some of the best moments of comedy during the film. This sort of balance is what makes a successful crowd-pleaser and Philomena is exactly that. It gives audiences everything they expect in terms of tone and warmth, but still treats them with respect and gives them something intelligent and witty instead of a loud, dumb blockbuster that does just the opposite. Most of that respect comes from the participation of the mind frame of Steve Coogan, who serves as co-star, co-writer and a producer. Script-wise, on which he collaborated with Jeff Pope, Coogan seems to have grasped the attention to story and humour that gave way to the success of his earlier 2013 film, Alan Partridge: Alpha Papa. However, very little of Partridge’s trademark humour seems to have passed on over to this movie which works better than expected because it allows him to branch out with his genre of writing, not exactly sticking to the foundations of only comedy. The script has a fair pace to it, allowing audiences to easily figure out what is going on without complicating matters and keeping them invested with one or two twists and turns along the way. When details about Dench’s child finally emerge, to say they are shocking would be underselling it. Where it goes from there shall not be divulged here, but it’s down to Coogan and Pope’s script that keeps you guessing every step of the way. Coogan also takes on a major role in the film as journalist Martin Sixsmith, who accompanies Philomena on her quest to locate her child. While Dench certainly gets the showier role, Coogan is just as impressive as a man whose cynicism threatens to distance himself from people who only want to help him. After this film debuts, you can bet there will be a lot more dramatic roles on offer for him, and hopefully he will take advantage of what he is given because he shows great promise as a dramatic actor. And yes, this reviewer is aware that he has done some serious acting work in the past, but if any of them has the most going for it it’s going to be with Philomena. Frears’ directing takes great note from the script and keeps things as surprising as they most likely read on paper. His focus on the story and how everything unfolds is precise and handled delicately, and dealing with such a difficult subject matter – as he did with portraying the emotions of H.R.H during the aftermath of Princess Diana’s death in The Queen – has proven to be another hurdle that Frears has successfully conquered. That subject matter happens to deal with the views of the Catholic Church on motherhood before marriage. As we see at the start of the film, a young Philomena (played in flashback by Sophie Kennedy Clark) is seduced by a boy at a carnival and becomes impregnated by him. Sent to a convent, she experiences the wrath of cold-hearted nun Sister Hildegard, who during the film’s powerful climax justifies her cruelty as being a fair punishment for Philomena’s youthful desires. It is through Hildegard’s seething rule that Philomena’s child is taken without her consultancy and adopted by an American family; the act that sparks the search to find him several years later. One could easily interpret this as a firm stance by the screenwriters against the ideologies of Catholicism – Coogan’s Sixsmith at one point blasts the “f**king Catholics” – but it’s less the ideology of Catholicism that’s at fault here, and rather how one such leader of a convent practised the methods to such an extreme manner, it ruined the lives of many women in similar situations. During one pivotal scene, Sixsmith wanders around the courtyard to find a collection of graves – one of whom marks a 14-year-old mother – disrespectfully covered by fallen branches and leaves. It’s implied that it was all an intentional act by the lead nun, as a result of their penance for birthing out of wedlock. With all this in mind, it’s shocking that a basic belief within the Catholic religion can be used to justify such heinous acts by this one person, and that’s where the true villainy lies. Not with the religion itself, but with the abuse of said religion’s beliefs. Therefore, those bound to cry out against this film and its supposed negative portrayal of Catholicism can rest easy, since they have the wrong end of the stick here. 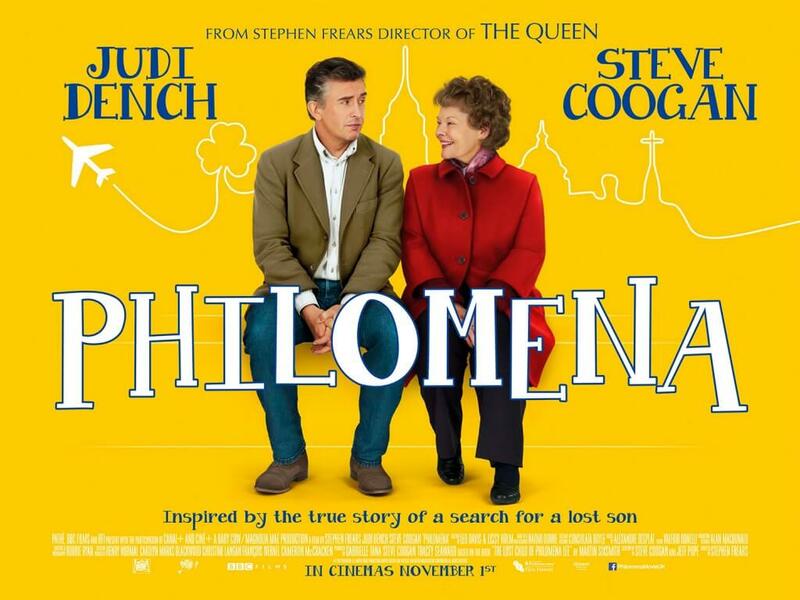 It’s seems like a good bet that Philomena is set to become a favourite with the British public, certainly obtaining some accolade nods by various awards groups, but it’s also a relief that at a time when everything has to be complex and deep to get attention by the masses, there is also a film that can get as much credit without alienating the audience with its intelligence. After all, the main character expresses an innocent desire to watch Big Momma’s House. You won’t find another film on the awards circuit this year that has the balls to suggest that Judi Dench would be interested in watching it. 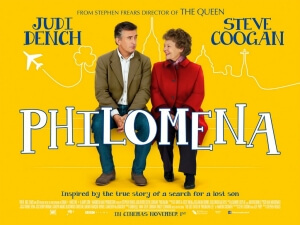 Philomena is a warm-hearted British film that has the power to alternately make you laugh and cry all on its own, thanks to confident directing, wonderful writing and two exceptional lead performances by Dench and Coogan.